Home / QuiBidder of the Week – Shanon G.
Today’s QuiBidder of the Week has been a member of QuiBids for a few months now, and has already completed a majority of her holiday shopping using our site. Please join us in congratulating Shannon in the comments below, then read on to learn more about her experiences using QuiBids. 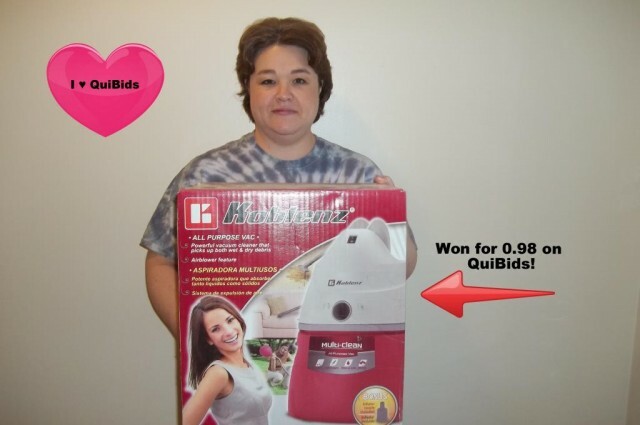 If you’d like to share your QuiBids story and become the next QuiBidder of the Week like Shanon, then pop out your camera the next time your QuiBids win comes in the mail, snap a photo of you with your win, then submit the photo here along with some details about your recent bidding experiences. If we choose your story to feature on our blog, you’ll receive a $50 gift card of your choice! Tell us about your QuiBids win from the picture. What’s your favorite QuiBids Game? “QuiBids is allowing me to get things for my family that I otherwise would not have been able to afford. I love getting great deals and QuiBids allows me to do that. Thank you Shanon for sharing your story with us! Remember to submit your photo and story here so you can be the next QuiBidder of the Week for a $50 gift card of your choice. Be sure to tell Shanon Congratulations in the comments!